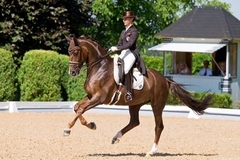 After winning the Grand Prix, Blind Date also won the Special of Achleiten. She started off with a really good trot tour for which she received high scores for her extensions and in the passage movements. Her canter movements were also very expressive even if we didn't count correctly once in the changes every two strides. And fortunately, the still hot weather didn't bother Blind Date at all and she had lots of energy during the test and was highly motivated. 75.21 percent meant not only the 16th victory in a row in grand Prix but also the 10th result above 75 percent.